Sixty-six books, forty authors, written over nearly 2,000 years, in many different genres. A worldwide best-seller published in countless translations and languages. A book that has been sworn by in court, fought over, and quoted in arguments. Clearly, the Bible is no ordinary book. 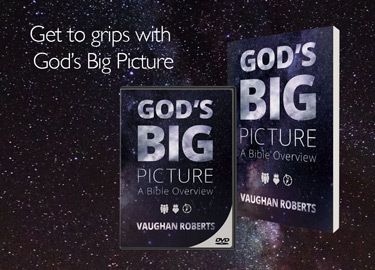 In this excellent course Vaughan Roberts describes God’s Big Picture, showing how the different parts of the Bible fit together under the theme of the kingdom of God. He offers us tools to read it with confidence, enthusiasm and understanding. Using DVD clips, Bible studies and discussion time, this course points us to the Bible’s supreme subject, Jesus Christ, and explains how we all fit into God’s Big Picture. God’s Big Picture will be run in the Parish Rooms over six consecutive Tuesday evenings during Lent, starting on Tuesday 12th March at 8pm. Please sign-up at the back of church or email vicar@ashtonhayes.church to confirm your place.